The South Orange County Community College District (SOCCCD), in concert with Saddleback College and Irvine Valley College (IVC), is developing a new education park at the former Marine Corps Station, Tustin. 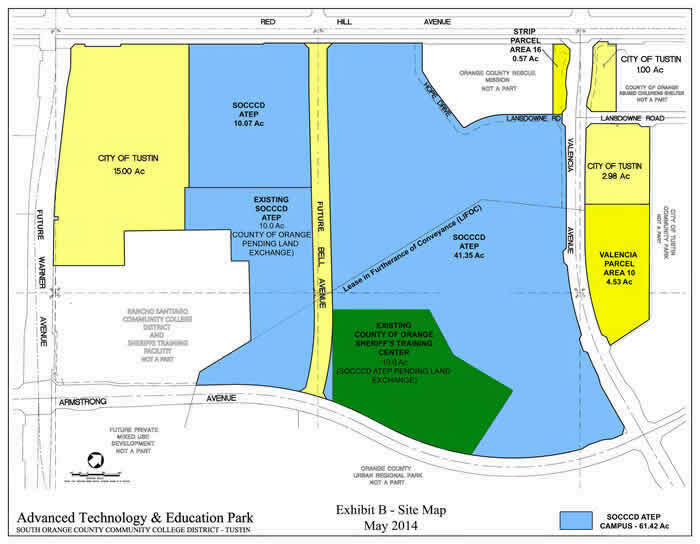 The Advanced Technology and Education Park (ATEP) is a 61.42 acre site in the 1,606 acre Tustin Legacy development located primarily in the City of Tustin. Tustin Legacy includes city and regional parks, housing, public schools, commercial business, a major shopping complex, and a research park. After acceptance by the City of Tustin on May 19, 2015, the SOCCCD Board of Trustees approved the ATEP Development Framework on June 22, 2015. The framework is intended to guide future development of the site and to assist potential educational and business partners in understanding the vision for ATEP. Click here for a two-page overview of the academic programs Saddleback College and Irvine Valley College have planned for the site. To achieve site development goals, a series of land exchanges took place between SOCCCD and the City of Tustin, former marine structures were demolished, and funding for the first building and utilities infrastructure was secured. The first building opened for instruction in March 2018 and is designed to house career technical programs for Irvine Valley College.